offers to you nice holiday and romantic accommodation in Pec pod Snezkou. Beautiful nature, active holiday, home cooking and wellness services are the foundation of unforgettable holiday. We offer stylish rooms, WIFI, billiard even place for kids. 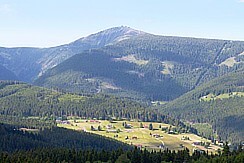 we have interesting packets for pleasant stay in Krkonose. New wellness centrum with whirlpool for 5 persons, sauna and other services are waiting for you. The skiing in Pec pod Snezkou, adrenalin sports or trip to Snezka you find with us. Pension u Veselých is a family-run guest house full of friendly and relaxing atmosphere. Our mission is to pass this well-being to all visitors and find something nice for everyone. You will not find a waiter in a tailcoat or reception, but you will meet our whole family, smiling people willing to give you any beer or information or sit with you at any time. Accommodation in 14 large mainly double bed rooms equipped with private bathroom. Stylish common room with bar is of service for our guests, classical drinks or archive vine enjoy yourself surely. You can meet your colleague in the lounge bar, for small children we have child's spot or trampoline outside. Rich breakfast, homemade dinner and new wellness with sauna and whirlpool create pleasant point after nicely spent day. WIFI connection is free all over the pension, as well as you can play billiards or table tennis. Newly built wellness center offers to you nice refreshments in the professional whirlpool for 5 persons. Two beds and sits, one deep chair Shiatsu and 48 jets give you extraordinary experience. For your refreshment or after frosty skiing you can use our sauna with possibility of cooling down in the tub of courage. After you enjoy yourself by some offered massage or you can loosen up in the small fitness. We offer to you interesting wellness weekends for couples or whole families. In the winter, just take ski or snowboard and rides immediately on the slopes of Skiport with 1.5 km long lift. Pension is situated in the center of Skiresort Cerna hora – Pec with 4 seat lifts and many ski lifts. There are number kilometers of running ski tracks. In the summer you can take a trip to the summit of Snezka finished by riding on the bob track in Relax center. Take a cabin lift to visit Cerna Hora with peat bog, go for cake to Lucni hut or you can visit ZOO Safari in Dvur Kralove with . We have a program for all the whole week.